Built by Built by Sikander Begum in 1860, the Moti Masjid is often confused with the Jama Masjid owing to its striking resemblance to the latter. Sikander Begun was way ahead of her time and in a time when men ruled kingdoms, paved way for female rulers. Her contribution to Bhopal shaped the city to stand out in its administrations, rich architecture and art and even today, her contribution form the backbone of Bhopal’s history. The Moti Masjid’s red towers with golden spikes, gorgeous white façade and spiritual ambience makes it an absolute must-see for tourists! How popular is Moti Masjid? People normally club together Taj-ul-Masajid and Jama Masjid while planning their visit to Moti Masjid. Very huge and historic mosque in Bhopal. There are a lot of stairs to climb and to reach the mosques main area. This mosque is located near the market so finding a parking for cars or vans is impossible. For scooter or bikes, there is no problem. Imams voice is amazing. Centrally located in the old city, a relic of the Nawabi era heritage. 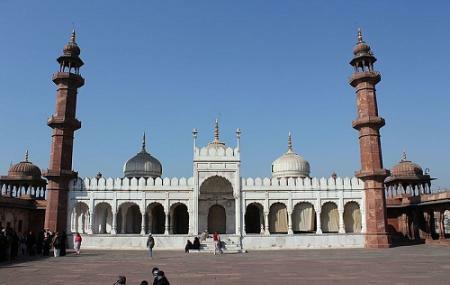 Built mostly in red stone, but the main prayer area is carved in pure white soothing to the eye marble. Two ablution pools add aura that is unmatched. Asia Biggest Mosque one the finest and historical mosque in all over the world .